A lot of games are inspired by all sorts of things. Some games have greater influences from social, digital or real-life history and media than others. In the case of Far Cry 4, Ubisoft's creative team captured quite a bit of influence from the heavy amounts of civil war and child soldiers that helped shape the history of the areas surrounding the Himalayas. Over on the PlayStation Blog, Sony sent a team out to basically take over the jobs of the typical gaming media journalists and interview the head-honchos of Far Cry 4's development at Ubisoft Montreal. Sony's team chatted it up with narrative director Mark Thompson and creative director Alex Hutchinson. The team went around areas where they could draw inspiration from real life unrest in civilly disruptive areas, such as the Nepalese civil war that helped shape the country. That's not even the worst part of it all, as there were horror stories captured to help give the game a heavy sense of danger at all turns from multiple groups of armed and insurgents and militia groups. Alex Hutchinson chimed in to support Thompson's remarks, noting that they weren't going for a brownish-grey shooter but they wanted something with a bit of color; something with a bit of life and bit of verve and some joyous destruction with a splash of saturation. There were some parts of Far Cry 3 that went pretty deep off the dark end, especially the awesome but unsettling parts involving Vaas. Absolute performance of the year, by the way. 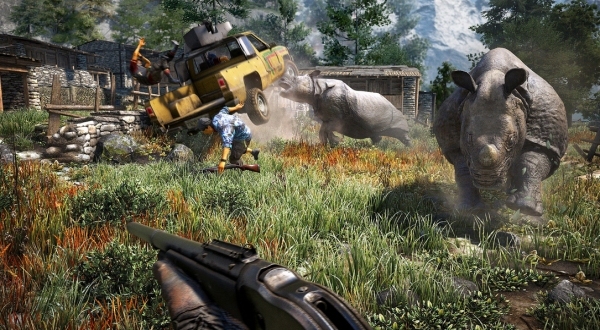 Far Cry 4 is set for release on November 18th. Also, that Winchester looks righteous, am I right? It was in Blood Dragon as the 1991 Galleria (an homage to Terminator 2) and it's such a shame we don't have more classic rifles like that in shooter games. You can only wield a camo-colored M4 with EOTECH for so long before it gets a wee-bit tiresome. You can learn more about the game by paying a visit to the official website.